1.Exercise children to grasp the ability to coordinate response and touch development. 2. Bright colors can help develop children's color discrimination and emotional ability ect. Warm Tips:Do not use high temperature, steam sterilization, avoid aging materials, thank you! It can promotes tactile development with different colors and shapes. With voice when you pinch it. 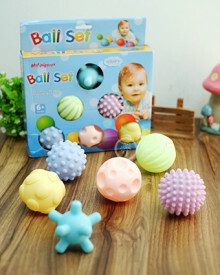 Different size balls bring different sensory experiences to the baby.